These stocks greatly outperformed the broader markets over the long run. Can they continue to return value to shareholders? You don't need to own the next big information technology stock to see eye-popping returns. Sometimes the most obvious long term opportunities are hiding in plain sight; the mistake is that the boring can be overlooked for the flashy. But in investing, "boring" can be great. That's helped Pfizer (NYSE:PFE), Hormel Foods (NYSE:HRL), and Ecolab (NYSE:ECL) turn $7,000 into $145,600 or more in the last 26 years. In 2013 there was a lot of talk of the patent cliff affecting major pharmaceutical companies. Pfizer wasn't exactly spared from the brunt of that trend -- sales have decreased every year since at least 2011 -- but it has taken action to keep shares humming along. 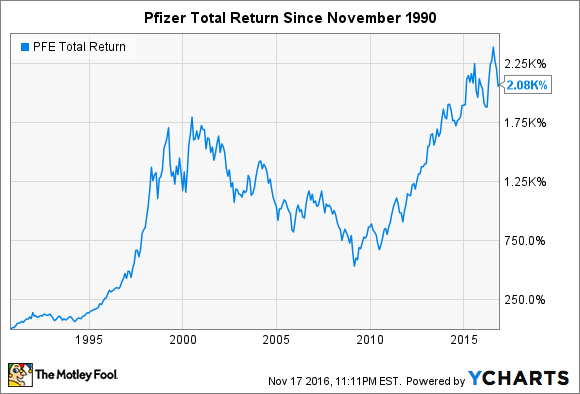 Despite a pullback from all-time highs set earlier this year, parking $7,000 in Pfizer stock in November 1990 would have investors looking at a position worth $145,600 today, including dividends. PFE Total Return Price data by YCharts. The largest run-up during the period occurred alongside the amazing market success of Lipitor, a statin that generated over $125 billion in sales from 1996 to 2012 on its way to becoming the former best-selling drug in the world. Lipitor succumbed to generic competition years ago, but share buybacks have allowed Pfizer to mitigate the effects of lost income. The company is now looking to spread its dependency over a portfolio of blockbuster drugs, with several potential blockbusters among the drug candidates in its pipeline. Those hopes took a brief hit with the recent failure of a cholesterol-lowering drug, but investors are optimistic that a formidable late-stage pipeline will reward their patience. 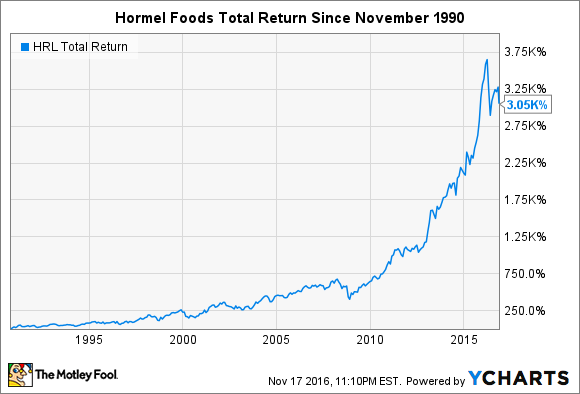 Hormel Foods may not be well-known among investors, but it has actually been one of the greatest-performing stocks of the last half-century. That's also true when dialing back the clock to November 1990. Since then, the owner of the infamous Spam brand has delivered a total return of 3,040%, which would have turned a $7,000 investment into $212,800 with dividends included. HRL Total Return Price data by YCharts. Today, Hormel Foods sports a market cap of $19.5 billion. In 2015 revenue topped $9.2 billion, a slight decrease from 2014, but earnings per share grew 13.4% from the prior year. The company is pinning growth hopes on brands of the future, which include Skippy (acquired in 2013), Muscle Milk (acquired in 2014), and Justin's (acquired in 2016). An eye for acquisitions helped to notch record third-quarter results in 2016, and allowed management to raise its full-year guidance -- with growth expected in 2017. 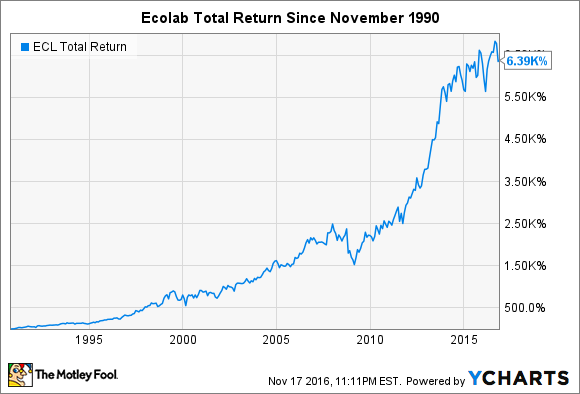 Environmental services have been big business for Ecolab, which has outperformed the S&P 500 in 21 of the past 25 years. A win streak of that order helped to turn an investment of $7,000 into $447,300 since November 1990 if dividends are included. The stock is currently lagging behind the index in 2016, but has benefited from steadily improving market conditions in recent quarters. The biggest slouch in operations, energy, is expected to begin improving in 2017. ECL Total Return Price data by YCharts. Ecolab has grown into a $33.3 billion company that posted $13.5 billion in revenue in 2015. While that was a slight decrease from 2014, currency headwinds and a sluggish energy sector -- Ecolab technology aids the production of 40% of the world's oil -- accounted for substantially all of the declines. Management sees smoother sailing ahead and expects full-year 2016 earnings per share to fall between $4.35 and $4.45 -- well ahead of 2015 EPS of $3.32. As Pfizer, Hormel Foods, and Ecolab demonstrate, buying solid companies and holding them for the long term can lead to incredible gains. They also serve as a great reminder that success isn't achieved in a linear upward path; there will be bumps, recessions, and factors out of management's control along the way. The important thing is to keep a level head and check that the long-term viability of the company remains on track.